I am not trying to be a pest, we are in this together…it helps to be informed. Do your research, but keep in mind four basic elements for success in controlling type 2 diabetes and other conditions. Medicate on schedule – develop a routine schedule to take your medicine; example: if you take your pills for type 2 diabetes at 9:00 am today, try taking it each day at the same time or as close to that time as possible. Use modern technology to help you remember, set an alarm on your cell phone or computer. Ask members of your support system (like a trusted family member or friend) to call you or help you with suggestions. Monitor glucose levels – I know it is not fun, for some it is painful and others simply forget. Stop, do not make excuses 🙂 this is very important so make it a priority. Again I suggest using technology and people who support and love you to help you. 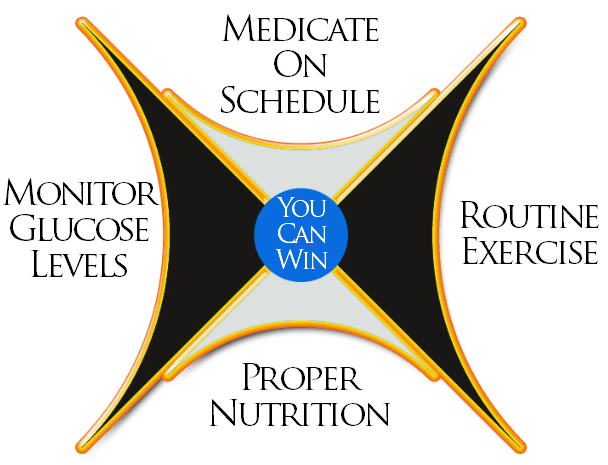 You can win; take control of your health. Proper nutrition – eating properly is very essential to being a diabetes beater. Hearing stories of my ancestors dying from diabetes helped me make a life-change in my eating habits; having type 2 diabetes is not a death sentence. I loved sweets, lemon meringe pie, peach cobblers, donuts and pastries, 7up, root beer, cream soda and the list goes on. Give ’em up if you want to live a healthy life; that is the bottom line. Routine exercise – you do not have to act like you are training for the Olympics. I mastered the other three, but this is my biggest challenge, especially after moving to southern California, the area I live in does not have nice parks. The oddest thing—not a deterent— was people laughing at me while I worked out in parking lots :-). The most difficult part for me is getting motivated, I often lack the energy to get going. But I know from experience that exercise is a key component in this struggle. I am happy to say that I am mindful of doing all I can to just keep moving, even if it is getting up from being in front of this computer to get water, cook or anything that will make me move. We can do this, are you with me? You can win, stop saying and thinking that you cannot do it! Often we defeat ourselves by less-than-positive thinking. You can change your lifestyle, you can live a normal life. YOU CAN WIN this battle; controlling type 2 diabetes is possible!